Puppies are simply lovable – but picking your new puppy on impulse or from a random dog breeder could result in tragedy. Each year, thousands of dogs end up in shelters, and the issue can often be traced back to the initial selection and purchase. Buying from a dedicated breeder who is passionate about the breed and who takes the time to make sure you are a good match for one another is the best way to be sure you’ll love both that cute puppy and the stunning and competent dog she’ll grow to be. Knowledge: Most dedicated breeders are enthusiastic about their dogs – not only their own pups, but the breed in general. They will be able to give you insight into how well the grown-up dog will fit your lifestyle and what to expect. 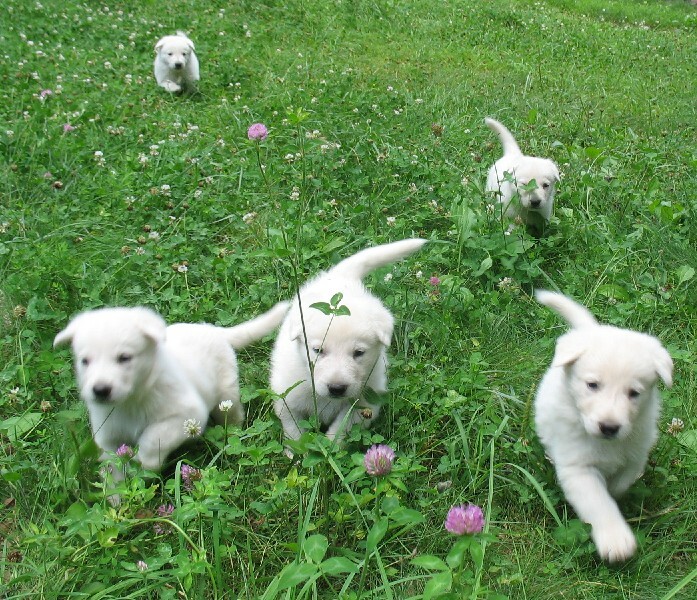 For our own pups, we make sure any prospective owner truly “gets” this dynamic and active breed and that they are an ideal match for a loving and dedicated adult White German Shepherd dog. Pups are treated like family – because they are: An occasional breeder, or worse, an irresponsible puppy mill, treat dogs and puppies like commodities. As a result, the dogs and offspring are not treasured family members, but products – and sadly, little care and attention is given to them. Even if you rescue a pup from this situation, there is no way of knowing if she was responsibly cared for in the critical initial stages of life. A reputable breeder will have adults and pups that are well cared for and cherished parts of the family, not just treated as breeding stock. Genetics Matter: Genetics matter for any dog’s overall health, but a large and active dog like a German Shepherd needs to be bred responsibly. Big dogs can have hereditary challenges when it comes to hips and joints; a reputable breeder will know this and ensure your new pet is not just a cute pup, but that he will be a healthy dog. An experienced breeder will be able to guide you and help give you insight into the dog you are considering bringing into your life.